Recently, somebody gave me a hair dryer which was not working. I don’t know how it happened, but I found that all the fan blades had been broken off. Without the fan blades, the hair dryer was practically useless. I had kept it because all the component parts – heater elements, switches, and motor was in perfect condition. Furthermore, the housing of the hair dryer looked attractive. A replacement axial fan would cost almost half the price of a new hair dryer, so it was not worth obtaining it. Furthermore, I don’t really need a hair dryer at this time. In fact, I had wanted to modify it to become a heat gun. At first I had wanted to convert the fan into a centrifugal one because this could produce a higher blower pressure, suitable for a heat gun. However, this would have meant that I had to fabricate a suitable centrifugal impeller together with its volute housing, making the endeavor quite a major modification. The existing fan housing would most likely be carved out and modified to become a volute housing. 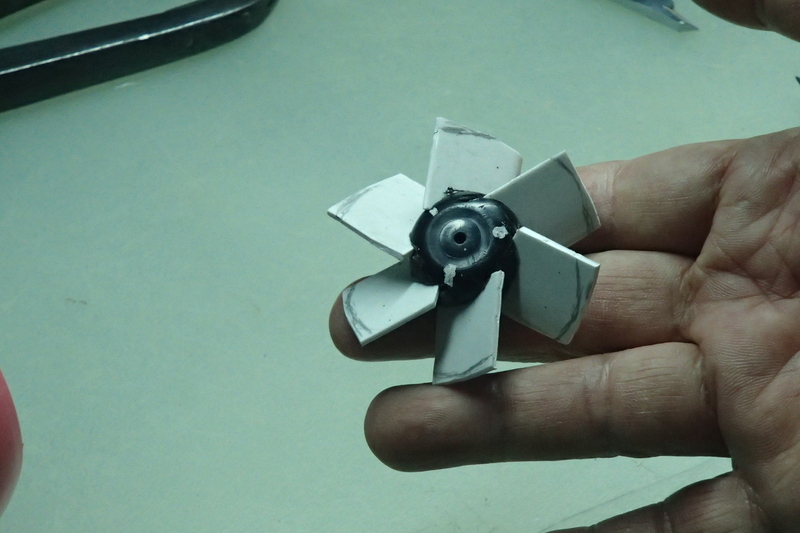 Then, the impeller would have to be machined out from plastic stock material. 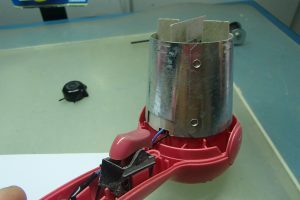 Many other tasks were expected with this route – design, cnc machining, fitting, gluing, obtaining loose items and many others. I decided not to take this route. I decided to repair the fan first and see what else I can do with it later. 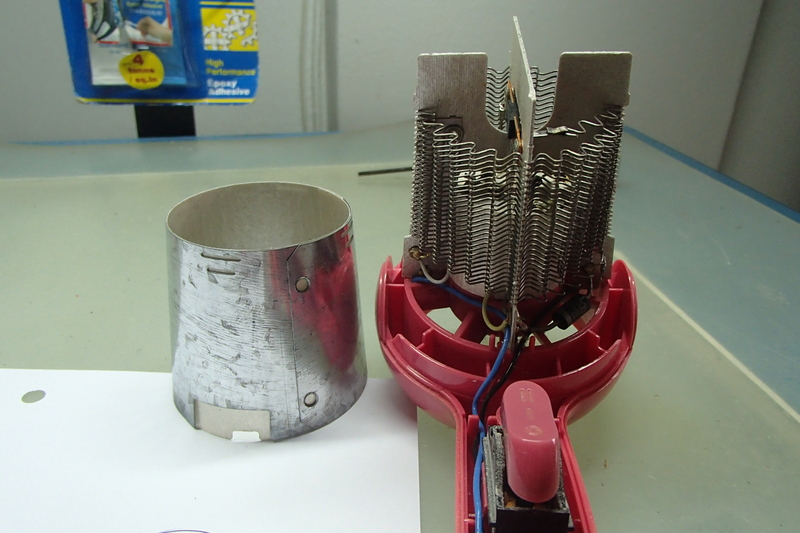 Luckily, the hub of the fan was still around with some small traces of the original broken off blades. I could use the latter as a guide for me to replace new fan blades. Slots were sawn at the hub following the angles of the original blades. These were enlarged slightly by filing down with a needle file so that the replacement blades made from the available plastic sheet material could be sandwiched in place. The plastic sheet material that I had were actually cut from electrical pvc casings used by electrical contractors. The blades were glued in place by epoxy resin and cut to size to fit the existing hair dryer axial fan housing. The blades were finished off by filing to shape. No attempt was made to balance the fan blades because it was close to impossible and also because it was such a small sized item and would not make much of a difference.